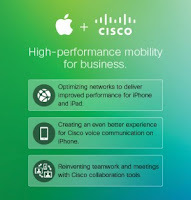 Apple and Cisco announced a partnership to create a fast lane for iOS business users by optimizing Cisco networks for iOS devices and apps, integrating iPhone® with Cisco enterprise environments and providing unique collaboration on iPhone and iPad®. To address the ever-increasing demands on corporate infrastructure, Cisco networks and iOS devices will be optimized so that they work together more efficiently and reliably with the goal of providing users with even greater performance. Apple and Cisco are also working together to make iPhone an even better business collaboration tool in Cisco voice and video environments, with the goal of providing employees with a seamless experience between iPhone and their desk phone. With Apple's support, Cisco will deliver experiences specially optimized for iOS across mobile, cloud, and premises-based collaboration tools such as Cisco Spark, Cisco Telepresence and Cisco WebEx in order to deliver seamless team collaboration and reinvent the meeting experience. Cisco and Apple both have deep cultures of innovation, and each of us brings expertise in complementary areas. There is no doubt our engineering teams will deliver incredible results as they drive deep joint development. Strategic partnerships and co-development are both key pillars of Cisco’s innovation strategy. This relationship highlights the value and innovative customer solutions that result when we do both. Together, Cisco and Apple will help employees and businesses collaborate and innovate anytime, everywhere, with an amazing user experience every time. We will do this by delivering a high-performance mobile experience for every employee, and a powerful collaboration platform for every business. This partnership is made for today’s mobile, digital world and we could not be more excited about what is possible as we move forward together. 0 comments on "Apple and Cisco partner to optimize Cisco networks for iOS devices and apps"